By most counts Quincy Jones is not a celebrity. Not that many people outside of the world of music know of him or if they do they are unclear as to much about him. But to many he is nothing short of a living legend. In fact, he won a Grammy Legend Award in 1991. He has been nominated for a Grammy Award 97 times, the most in the history of the award. Of those he won 27 times, the most of any living person (only the Hungarian conductor Sir Georg Solti has won more with 31). It is impossible to read of even a part of his work in the decades he has been involved in the jazz and pop music scene without being impressed with the names of people you most definitely have heard of with which he has worked closely. I’ll not try to name even a few of them here. From what I have seen those that have worked with him love him, for he seems to treat others with dignity and conduct himself with a sort of graciousness and class. This last Sunday there was a terrific piece written about Mr. Jones in the Washington Post by Deneen Brown. I’d encourage you to learn more about this musical and artistic giant from the article by following this link. I remember quite a bit of the trip to the hospital and my being examined in the emergency room. I remember being taken down a hallway and elevator toward Intensive Care. By the time I reached ICU I was unconscious and unresponsive. Several days later the doctors told my family they were “not optimistic”. Despite all they had done I was not responding. It started to dawn on my wife she might be called upon to attend to funeral arrangements. I heard music and got up from my hospital bed where members of my family had gathered and I went searching for the source. Traveling up some stairs near my bed I found a small chapel or cathedral directly above my bed on the lower floor. Inside the chapel were five towering beautiful black speakers. I went up to one of the speakers and examined it. I was overwhelmed by the music coming from those speakers. I realized the sound coming from the speakers to be angels singing. It sounded like the very voice of God. Standing in the center of the room with tears in my eyes the waves of music washed over me. I walked out of the cathedral and was greeted by a young woman. We sat at the top of the curving staircase I had climbed moments ago and listened to the music. She insisted on tending to my bare feet. After a short while I left to go back down the stairs and tell my family of the cathedral I’d found on the floor above my bed. I was eager to tell them of the beautiful speakers that rang out with the voices of Angels. Only there was no cathedral. No speakers. No stairs. I had not left the bed. They told me days later what had really happened. Five men came to my bed at the hospital and introduced themselves as members of the Harbor Light Choir, a division of the local Salvation Army. They came to the hospital weekly and visited beds at random. They asked for permission to sing and pray around my bed, and were given that permission. As they started to sing I started to respond. Over the next few days I gradually and slowly recovered, making my way back to the people who love me. It was not instantaneous. It involved straight jackets, breathing tubes, and a visit to a tavern filled with creatures I could only describe by referencing the bar scene in the first Star Wars movie. It involved more attention from my doctors, my parents and my wife. It involved walkers and embarrassment and a lot of time spent regaining my strength. But all of that came after the visit to the cathedral meilleur site pour acheter cialis. To my mind it was as if I woke up from a long sleep to hear the music. I recently read a few members of the Harbor Light Choir visit Methodist Hospital every Thursday. I was told some people in the hospital turn them away rather than give them permission to sing and pray. They bring the voice of God, music from the angels, ask for nothing in return, and are turned away. What a shame. What an unrivaled pity. 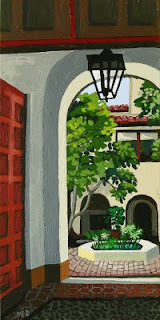 Note: The image above is from a painting by my wife, Melinda Patrick. Morning Edition, November 8, 2007 – The power of Wal-Mart can now be measured on The Billboard 200 music chart. The Eagles are No. 1 this week. Their new album Long Road Out of Eden almost didn’t make the trip to the top because of Billboard’s longstanding rule that albums must be sold in more than one outlet. But, if that one outlet is Wal-Mart, just maybe that rule could be changed. And this week it was changed, bumping Britney Spears Blackout from the top spot. Personally, I like WalMart. They save me a lot of money. Oh, by the way. The top 10 commandments of Bluesville are always subject to change. If you’re looking for me, I’ll be at Low-Fi’s.